I thought of this little circus unicycle rider awhile back. 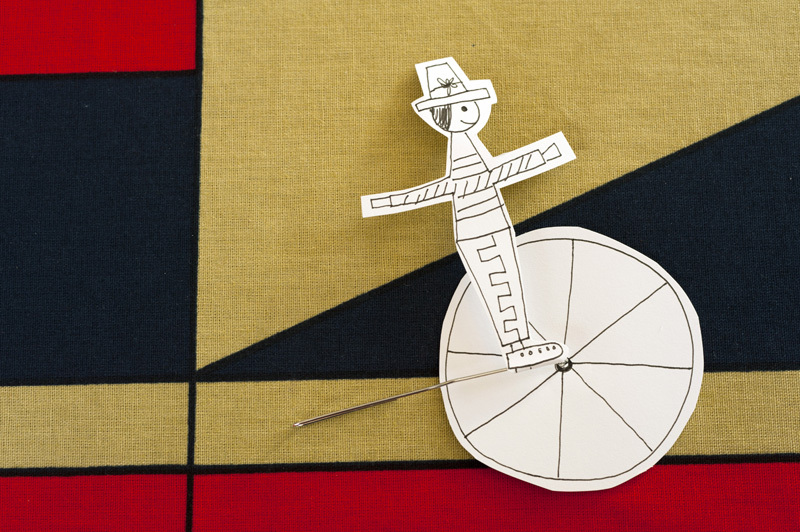 It’s easy to make, but requires pretty good motor control to wheel around, which is great for kids. If you want to try it out, watch the one minute video to see how to make them. 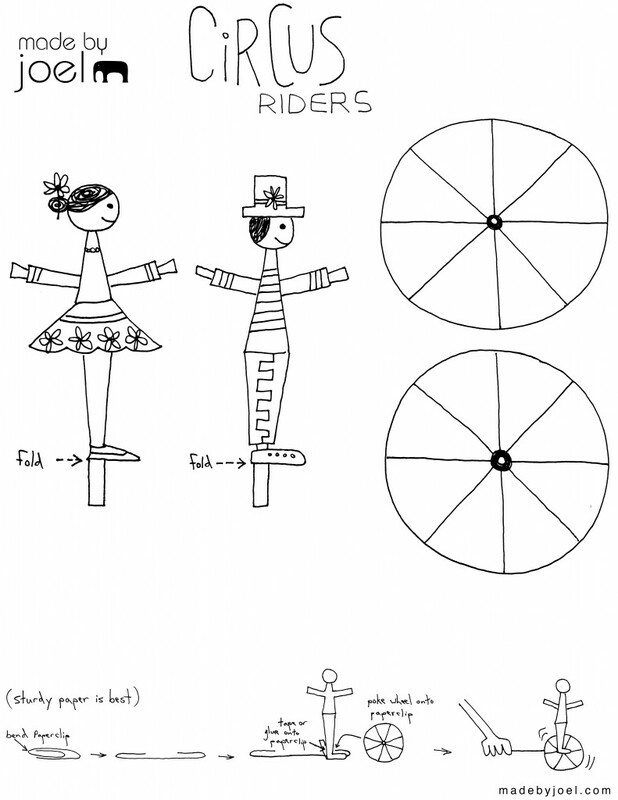 There’s also a template below, but I encourage you and your kids to try drawing your own figures as well – circus bear, monsters, bat man….? Have fun! UPDATE: Someone noticed that the template above was better for left-handers. Whoops! Below is a right-hand version. Another great idea! If the wheel is colored with multi colors, kids can enjoy the changes in colors while it's spinning. Thanks a lot! It's great, Joel! I love the music, too. What's that instrument you played, Joel? Thanks everyone! The instrument is a kalimba. I borrowed it from my kids toy box. ha. Gorgeous!!! We have to make these... have to, have to , have to!!! Love them!!! Hope you are having a fun weekend!!! Geez, thanks again for the great projects that you so generously share! I am an elementary school librarian & we often make your projects in library class. There is always a connection! Yes, of course. Go ahead! Thanks! Joel, these are some next level, paper clip toys. Love them! 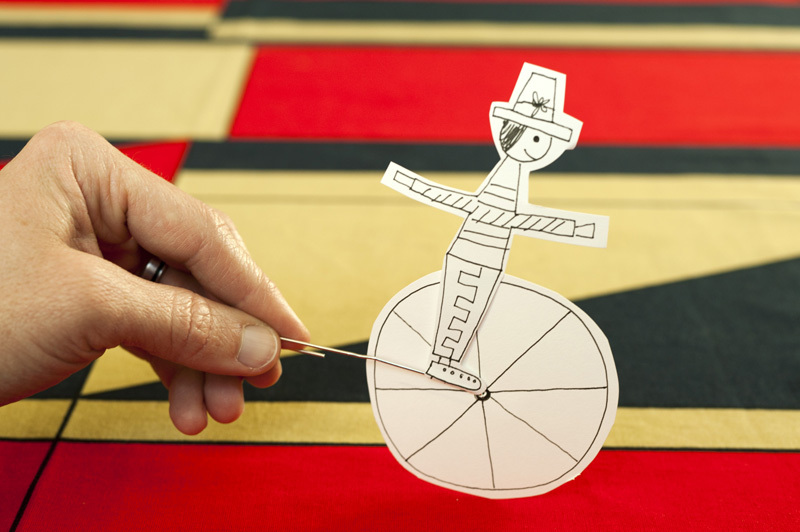 We're still rocking on the paper clip standup toys you did a while back. We've adapted them into hooks as well so that humpty can sit (and fall) on the wall of a shoebox. Will have to give these a go on the weekend. Thanks. Thanks Pete! And that humpty dumpty toy sounds awesome! You'll have to snap an instagram of that if you get a chance! I don't know which I enjoyed more, the project or the kalimba! Great job playing a tune on that! i am doing art outreach with my son's kindergarten class next week. 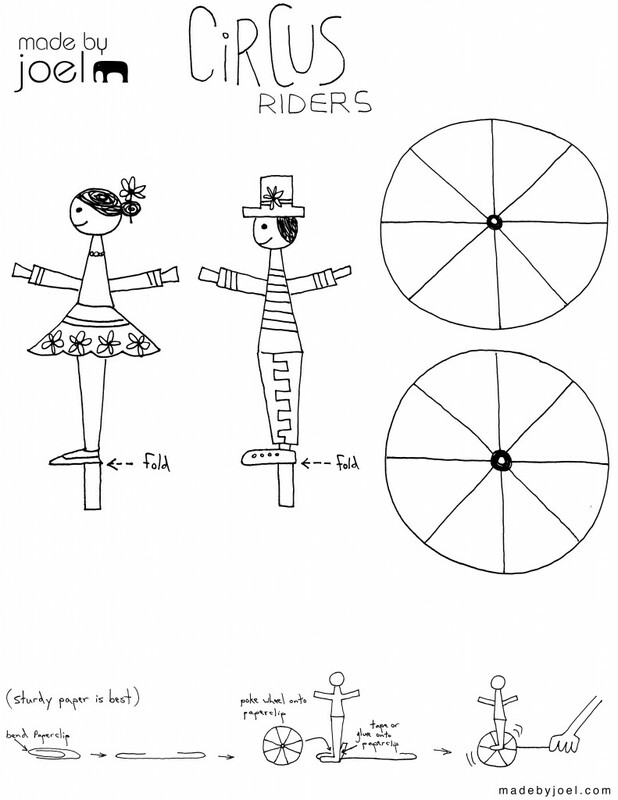 we are learning all about circus art and this will be the perfect project for them to do after we study the prints! thank you!!!! How can I put this on pinterest? Hi, thanks Ali. 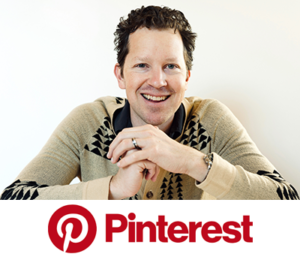 Do you have a Pinterest account? If not, you'll need to get one. (It's free.) Then when you get signed up, they tell you how to pin things. I use the little bookmarklet thing, so I just click that and it shows all of the photos on the page, then you select the one you want to pin. Realy funny ! Thanks a lot for this great idea ! You make my heart happy! I'll be doing this with my daughters play group tomorrow, thanks! OK, I just posted a right-hand version! (See above.) Thanks for noticing that Thuy-Lan! That's a fantastic rocking bird design! What a cool idea, and also very enthusiastically explained by your daughter. So great! Great idea Christina, thanks for sharing! I just cannot tell you enough how much I adore EVERYTHING you make! Just LOVE it all! I pinned like crazy! Wow! Thanks SO much! The kids will have so much fun with all this amazing stuff--and just in time for summer, too! Lucky us! Wow, thanks Angelina! Too kind! Really glad you found my site. Hope your kids have fun!